Mame-loshn - the Yiddish word for “mother tongue” or "native language". Mama-lotion - Our given name for THE lotion that renders Gorgeously Yiddish skin! “Mama-Lotion" -- the name of our stunning lotion range -- is an intentional play on the phrase “Mame-loshn”, which is the Yiddish word for “mother tongue” or “native language”. And, seeing as how this exquisite blend speaks volumes to needy skin, we thought it was an apt name for this incomparable moisturizer. Born from an age-old recipe, here magical notes of Cocoa Butter are enveloped in pearls of high-grade essential oils and active plant extracts of Ginseng, Echinacea and Ginkgo Biloba and Dead Sea Saltwater. Together, each unique ingredient is blissfully blended with organic Olive Oil, Hemp Seed Oil, Sweet Almond Oil and Jojoba to grace your skin with unfiltered perfection that renews and refines. Plus, in grand SpaMitzvah fashion, our lotions are soft and silky – never greasy! Spa girls, rejoice .... supple, soft and seductive skin is on the way. And, we dare say, this is the “mama” of all lotions and a "come to papa" creation that will addict you from start to finish! That said, there is nothing else to do but brace yourself!! This is exquisite body lotion, runneth over with the serenity of herbaceous Ginger with a splash of Italian Bergamot. 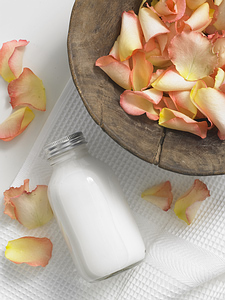 This is exquisite body lotion, sprinkled with elegant notes of organic Rose, sweet Vanilla, African Geraniums and Honey.